Don't get caught with your toolbelt down- learn these techniques and tackle any household emergency with ease. 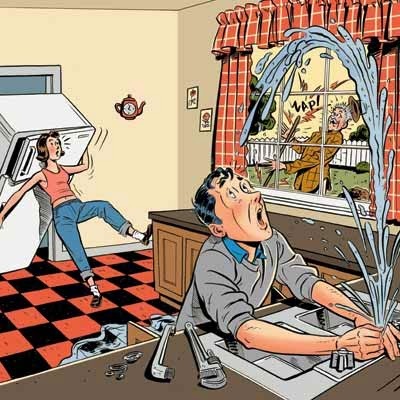 To replace the washer, turn off the water supply valve under the sink. Stuff a rag in the drain so you don't lose parts, then take the handle apart. Pop the screw cover on top, remove the screw, and pull off the handle. Use a wrench to disassemble the stem, and line the parts up on the counter in the order they came off, so you know how it goes back together. Examine rubber parts or plastic cartridges for cracks, and take the offending piece to the hardware store for an exact replacement. Reassemble the parts you've laid out, in reverse. Then revel in the ensuing peace and quiet. Remove the stopper and block off overflow holes. With water in the bowl—the water puts more pressure on the clog—plunge with a flat-faced plunger. If that's not enough, get under the sink and take off the trap to see if that's where the clog is lodged. If the blockage is deeper, rent yourself a hand snake. Slowly push the coil down the drain, carefully twisting, pulling, and pushing when you hit the blockage. Cut two pieces of cardboard from a box. Use the edges of the cardboard to corral the pool of paint. Then use the pieces to form a scoop, and lift the liquid back into the bucket. When most of the liquid has been cleared, get two more buckets—one with fresh water and one empty. Saturate the remaining spill with the clean water, then scrape and scoop it up with a fat spoon and put it in the empty bucket. Work fast and continuously, replenishing the clean water as necessary. Rent a carpet cleaner to follow up; just be sure to keep the paint spot wet until it gets there. Cut a raw potato in half and, with the power off or the lamp unplugged, press the cut end onto the jagged glass. For a comfortable grip, select a potato with a tapered shaft. The University of Idaho's Stephen Love, Ph.D., recommends a Russet. "All grout can be cleaned," says Debby Parker, a contractor who bills herself as The Tile Lady. Her secret weapon: a steam cleaner, which brings most any stain to the surface so it can simply be wiped away. Brushing on a penetrating sealer will keep the grout stain-free.